Yoo Hye Jung (Park Shin Hye) has had a tough childhood and difficult life. She has dealt with the life challenges by becoming emotionally guarded and acting like a tough bully at school. When Hong Ji Hong (Kim Rae Won) meets Hye Jung, he recognizes her intelligence behind her gangster facade. However revenge sets her on a path to become a doctor in a neurosurgery residency at a major hospital. Hye Jung works alongside fellow residents Jung Yoon Do (Yoon Kyun Sang) and Jin Seo Woo (Lee Sung Kyung). But when Seo Woo becomes Hye Jung’s biggest rival both professionally and personally, can Hye Jung overcome yet another major obstacle to her own personal happiness? I’m still not quite sure whether to like and recommend this drama, or to dislike it. I don’t wanna sugarcoat it, so i’m just going to put it out there. I loved it at some points, but hated it towards the end. I fell for it’s charm in the beginning, the cute innocent love story, the attractive characters and especially Park Shin Hye. I’m amazed by her development from the childish actress she was in Beautiful You, till the confident her in both Pinocchio and this one. It showed us a different side of Park Shin Hye. The cast was strong and the story was very promising. So what went wrong? Well, first of all they could have made Ji Soos part bigger, I mean a hot delivery guy… Why not :b On a serious note though, the storyline got dragged, every episode had it’s own mini-stories, but the overall background story went so slow, and at times you even forgot it. I can’t believe I’m saying this, but there was too much romantic stuff between the lead couple, you kind of get wearied of it. In the end I started supporting the second lead, because I felt that would be more convincing! The first few episodes were probably the best part of the drama. I kept watching till the end though, because of the character developement in the beginning. The director did a good job with hooking us on the drama till the end, but he leaves you dissapointed! Overall this drama lacks a strong plot. This is not the drama for you if you're hoping for a complex plot. As a start I have to say this: my rating might be a bit ‘nicer’ than Kamjis, but that is not because I disagree with her. It is because I can bring myself to rate harshly – it is quite hard expecially since I enjoyed a bit of it. Okay that said, I have to almost totally agree with Kamji. Though I already at the beginning knew this would be one of those dramas: weak. This drama has the thinnest plot every, and the weakest story EVER. I mean 20 episodes of doctors crushing at each other, and a bit of bickering here and there does not make a drama. This drama actually had potential; with some of the most amazing characters written – and with some of the wittiest dialogues ever made (in Korean drama world that is). But that is where it ends. As a medical drama there was a bit too little – or at least not enough – of medicine. Patient story were too short and few if you ask me… even if they were good, there weren’t enough. Then again that is MY opinion. 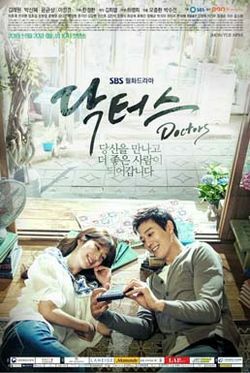 I enjoyed this drama mostly because of Kim Rae Won and some of the supporting characters – other than that I was bored. Like this drama is generally boring with a few laughs (because of the clever lines) here and there. So all in all, a drama that will very soon be forgotten, even if it was hyped and had a lot of viewers.